Every year, the NBC television network introduces new TV series, which are either cancelled or renewed by the season’s end. Likewise, some existing shows are also some under-performers that wind up as the television vulture’s TV dinner du jour. Although everyone understands the Nielsen ratings usually play a big role in TV cancellations and renewals, most fans don’t get to participate in that system. Since so many viewers’ opinions do not factor into the Peacock Network’s programming decisions, we’re offering you the chance to vote on NBC TV shows here, instead. You can vote on the following NBC TV series that have premiered (so far) during the 2017-18 television season: AP Bio, American Ninja Warrior, America’s Got Talent, Better Late Than Never, The Blacklist, Blindspot, The Brave, Champions, Chicago Fire, Chicago Med, Chicago PD, Dateline NBC, Genius Junior, The Good Place, Great News, Law & Order: Special Victims Unit, Law & Order True Crime, Little Big Shots, Making It, Marlon, Reverie, Rise, Running Wild w/ Bear Grylls, Shades of Blue, Superstore, This Is Us, Timeless, Trial & Error, The Voice, The Wall, Will & Grace., and World of Dance. What do you think? Which NBC TV series do you rate as wonderful, terrible, or somewhere between? 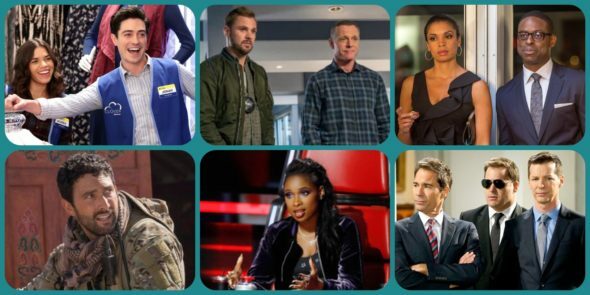 If it were left up to you, which NBC TV shows would be cancelled or renewed for another season? Don’t forget to vote, and please share your thoughts, below. I love Blue Bloods and I always will. It makes me keep hope that family will not be lost in America.